Featured Species: Dragons and Damsels! 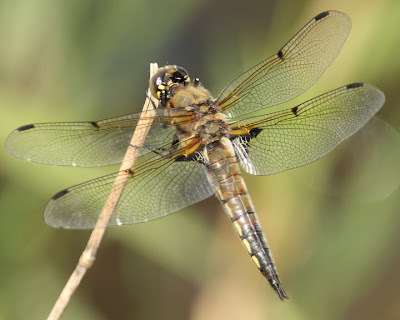 Late-June is a great time to visit water bodies, in part due to the activities of dragonflies and damselflies, the needle-like insects patrolling the water. A captivating 30 minutes can be spent watching an adult emerge, and if your timing is right you may be lucky enough to be amidst a mating swarm. Dragonflies and damselflies are of two worlds - nymphs are freshwater aquatic (and quite predaceous! 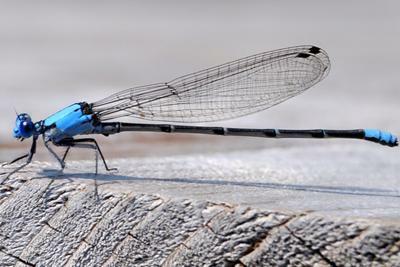 ), and the adults are terrestrial (and thankfully eat lots of mosquitoes!). Their lifecycles are described as an incomplete metamorphosis since there are shape changes but they do not undergo an inactive pupae stage. At this time of year mature nymphs make their way to water’s edge and onto vegetation, rocks, and logs. Then out of the back of the larvae’s skin emerges the adult (this is better than science fiction!). Next, over about 30 vulnerable minutes, the adult’s wings unfold as their insect blood (haemolymph) flows into the fine veins. Then they fly to protective cover to harden and sexually mature. The nymph skin (exuviae) remains clasped to the vegetation, rock or log, as evidence of what occurred and where. Once hardened and matured, adults disperse to water to feed and mate. Sometimes thousands of a single species will emerge on the same day, which is thought to maximize the chance of finding a mate. Mating is another mind-bender. First the male transfers sperm from his sexual organs at the end of his abdomen to other sexual organs located closer to the wings. Then using claspers at the tip of his abdomen, the male locks onto the female behind her neck – this is the ‘tandem position’. Should the female like the guy, she brings her sexual organs up to where the sperm is – this is the ‘wheel position’. In some species the male is adapted to remove any sperm already within the female before depositing his own. The pair separate, and the female lays her eggs. 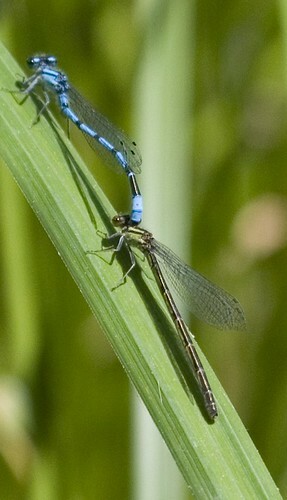 In some species, the male continues to hold on or stays close to make sure another male doesn’t mate with her. Most eggs are laid in water, but some species inject eggs into aquatic plants. When eggs hatch the nymphs feed and over-winter underwater. Common Green Darners exhibit both this typical life style of over-wintering as aquatic nymphs, and also as migratory adults that spend our winter in the southern states. 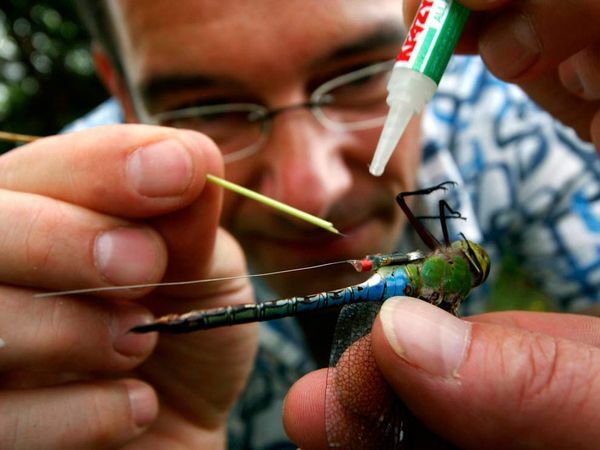 Radio-tagging research has showed that they may fly up to 140 km in a day. Migratory individuals arrive north as early as the beginning of April and mate and lay eggs right away. 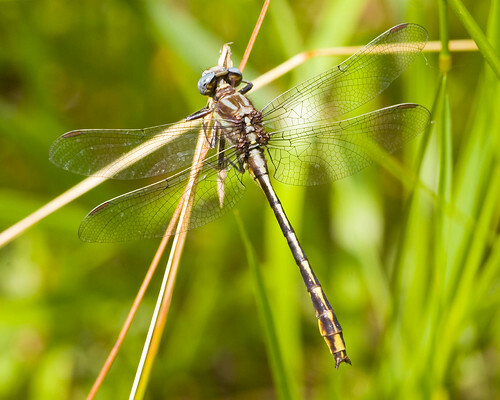 The nymphs develop quickly (for dragonflies) over the summer, and adults emerge ready to migrate in late August through October. Summer officially begins! The combination of the Earth’s tilt (23.5º) and 365 day (actually 365.2422 day) orbit around the sun determines the duration and incidence of sunlight received. On June 21st, at 6:07 A.M. EDT, the summer solstice, the northern hemisphere of Earth will be at its maximum tilt towards the sun. It will be our longest day of the year, and at around noon the sun will be highest in the sky, casting the shortest shadows of the year. Astronomers hypothesize that Earth got its tilt when a Mars-sized planet slammed into Earth, which also ejected matter that became the moon. Click here to watch a breath-taking film about Earth called ‘HOME’. Luminous love is in the air - as it gets dark, the slow Morse code of firefly light begins to glow. 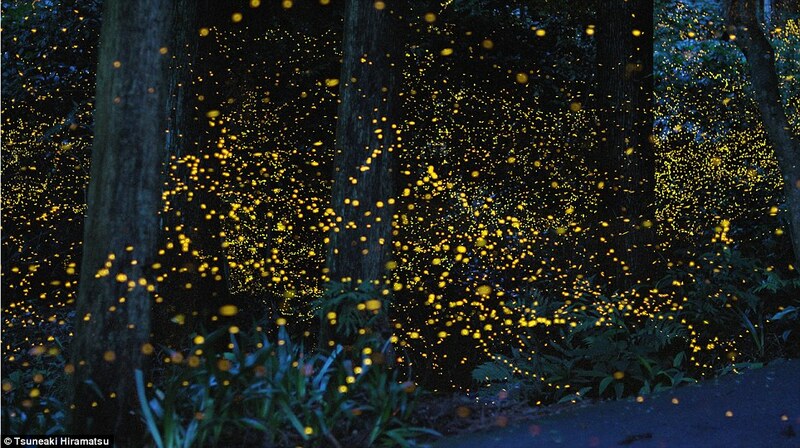 Fireflies are beetles (not flies) that have a special organ that produces light (bioluminescence). The lights are used to attract a mate, and some species have their own distinctive lighting pattern. In most North American species the male does the flying about and the female perches on vegetation near the ground. There are also larger, predaceous species that mimic the light code to lure smaller species close enough to capture, as well as non-luminous fireflies that fly during the day, and are believed to use pheromones to attract a mate instead. 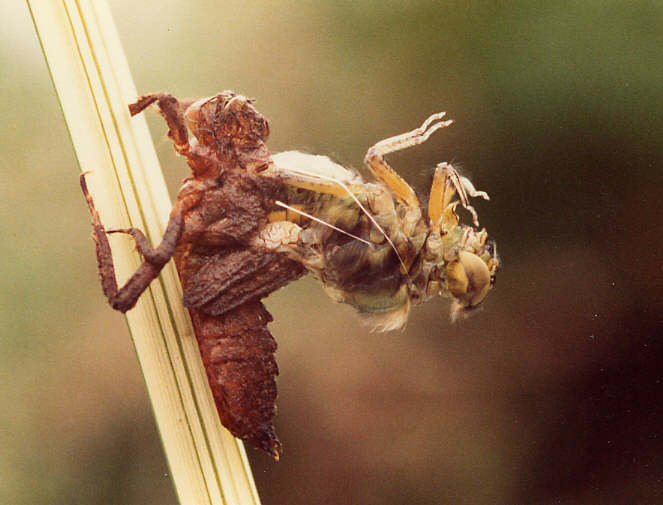 Keen observers can also find camel crickets, flower fly larvae (bee and wasp mimics), and fungus-feeding beetles. Butterfly-watching is at its best with many different species flying. White Admirals, Canadian Tiger Swallowtails, and European Skippers are particularly noticeable. 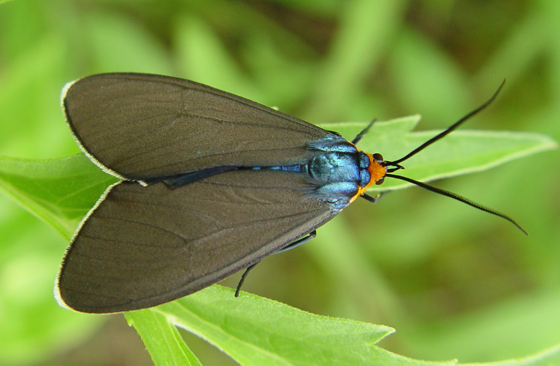 The Virginia Ctenuchid moth also flies during the day. 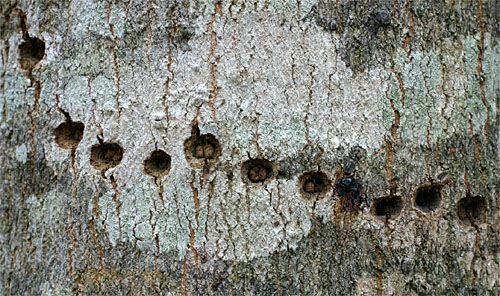 Yellow-bellied Sapsuckers switch from feeding on Sugar Maple sap to birch sap, creating distinctive matrices of shallow holes. They also feed on fruit and arthropods that are sometimes trapped in the sticky sap. Northern Ringneck and Eastern Milk Snakes lay their eggs in June and July. Trying to avoid the snakes are Eastern Red-backed Salamanders that are also laying their eggs. 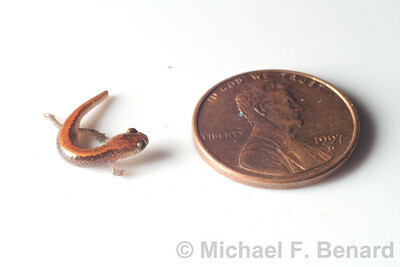 Unlike most salamanders they are completely terrestrial. They lay their eggs in moist places under rocks and logs, and hatch from eggs as miniature adults. Young Spring Peepers and Wood Frogs emerge from ponds. From BC to Ontario, baby American Badgers are venturing out from their dens (scroll down). The American Badger is endangered in several provinces and nationally. Besides knowing few are left, little is known about this animal. Reported sightings are extremely important to researchers trying to learn about badger ecology. Native Spotted Coral-root, and Common Milkweed, and non-native Northern Catalpa, Common Viper’s Bugloss, Climbing Nightshade, Garden Bird’s-foot Trefoil, Chicory, and Common St. John’s Wort bloom. Serviceberries are the first shrubs to boast ripe fruit. The Summer Triangle , in the northeast sky, is made up of Vega, Deneb, and Altair. The moon passes by Jupiter during the evenings of June 22 and 23, while Saturn is in opposition on the 27th, being closest and brightest for the year. It will be joined by the full (Strawberry) moon. Venus and Mercury feature to the west just after sunset around the 29th, while the moon and Mars rise together on the 30th. It is the end of another school year. We have enjoyed bringing you some of the fascinating events that have happened in the natural world over the past 10 months, and look forward to starting again in September. Have a great summer!